September 2018 6 www.sportseventsmagazine.com Volume 15 • Number 9 • SEPTEMBER 2018 LINEUP Editor's Letter . . . . . . . . . 4 Sports Talk . . . . . . . . . . . 8 Issue Sponsors . . . . . . . 50 In Every Issue: One-on-One 'How to Coach Girls' Provides Insight for Creating Successful Teams A new book was written to keep girls in sports for life. Game Plan How To Ensure You Have The Right Insurance Coverage What sports organizations stand to lose without proper insurance coverage. Fan Favorites Destinations with Awesome Events Facebook fans voted for their favorite destinations and events from a list of 12 nominees. See the top picks. Sport Report Wrestling: 'Packs 'Em' In & Pumps 'Em Up' Fans turn out in record numbers to support wrestling events. 11 38 Vermont 39 Connecticut 40 Maryland 45 Mississippi 47 Puerto Rico 48 North Dakota COVER: 35 29 13 Participation in gymnastics helps develop the complete athlete. 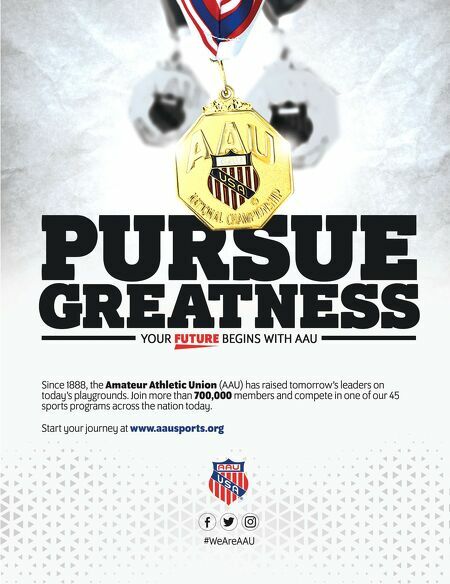 State Spotlights Updated Convention Centers, Civic Centers & Arenas Offer Unique Options for Sports Events GOOD BONES 14 SPECIAL FEATURE: 2018 Guide To Sports-Friendly Convention Centers, Civic Centers & Arenas A state-by-state listing of some of the most sports-friendly convention centers and arenas. Open-concept, convertible spaces, green areas and technology are among the upgrades and additions to convention centers, arenas and other public spaces. 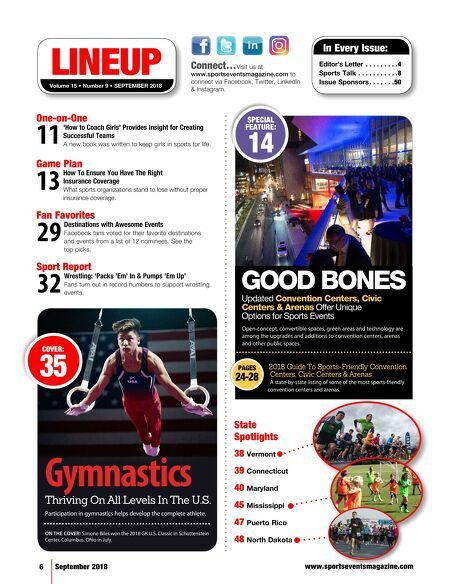 PAGES 24-28 32 Gymnastics Thriving On All Levels In The U.S. ON THE COVER: Simone Biles won the 2018 GK U.S. Classic in Schottenstein Center, Columbus, Ohio in July. Connect… Visit us at www.sportseventsmagazine.com to connect via Facebook, Twitter, LinkedIn & Instagram.